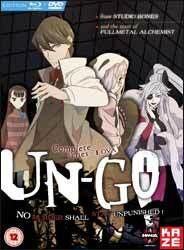 Un-Go (2011) is an eleven episode anime show, directed by Seiji Mizushima and written by Shō Aikawa. When we first meet Yuuki, he is attending a ball held by Kaoru Kanou, a man under suspicion of financial irregularities. During the ball Kaoru is murdered. The blame is placed on an officer who is found shot in an elevator, but Yuuki is not so sure that the police would murder a suspect. He uses his skills at detecting and Inga’s special abilities to discover that the murderer was actually Kaoru’s wife, who wanted him to die with his honour intact. Although, this sets up a basic police procedural show, albeit with the paranormal abilities displayed by Inga, the series becomes so much more as it progresses. Inga has the ability to ask anyone one question which they have to answer truthfully. As the episodes progress the show builds layers of information about the world Yuuki inhabits, so you really have to watch the whole season in order to get the most out of it. The animation is bright and looks good on the two DVD set, audio is either English or Japanese 2.0 with English subtitles. You get all of the eleven episodes, plus the prequel episode as an extra, although I’d advise you to watch this last as it lays bare the relationship between Yuuki and Inga, which will spoil the mystery. There are only two other extras on the set, a Karaoke Version of the Opening Title Sequence and Closing Sequence. You also get little trailers for the next episode at the end of the preceding one. The PR blurb says that the show come as a Blu-ray/DVD combo set, but we only got sent the DVD’s, so I can’t comment on how much improvement watching the show in Blu-ray will be. Overall this was a good show which starts out as a slow burner, but the inclusion of layers means that you will look back at the show, as a whole, as a rich and rewarding experience.